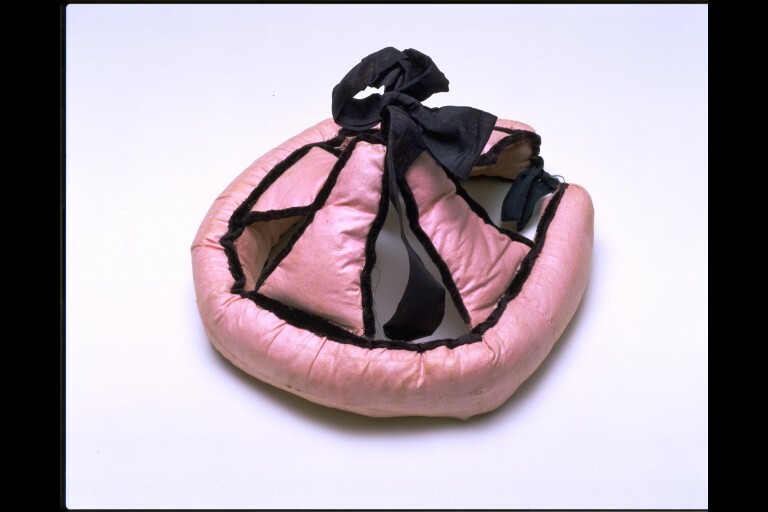 This ‘pudding’ is a safety hat for a young child learning to walk, designed to fasten horizontally around the head above the ears. 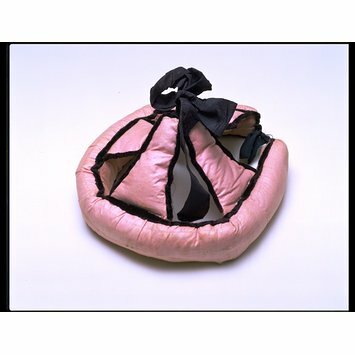 The ‘pudding’ consists of a horseshoe-shaped roll of glazed pink cotton with four lightly padded triangular flaps attached at regular intervals, two of them fastening together over the head. Many small children in the 17th and 18th centuries wore this type of hat, which helped to protect them from head injuries if they fell. The nickname of ‘pudding’ comes from the padded roll’s similarity of shape and size to the type of sausage called ‘pudding’, a popular food still eaten today. Child's 'pudding' (a safety hat for a young child learning to walk, and designed to fasten horizontally around the head above the ears). 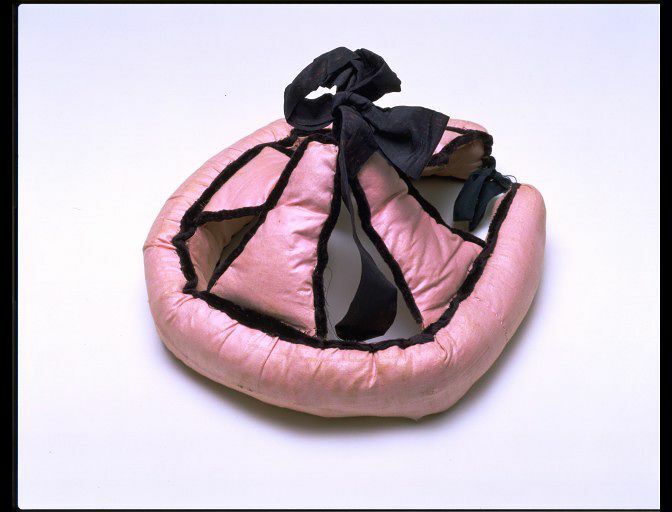 The 'pudding' consists of a sausage-like horseshoe-shaped roll of glazed pink cotton, which has a padded white linen inner stiffened with wire and card, and a black petersham ribbon tying string at each end. Four lightly padded triangular flaps of self fabric, stiffened with card, are attached to the roll at regular intervals (partly covering the crown of the head), two of them fastening together over the head with tying strings of broad black silk ribbon. The edges of the triangular flaps and the top seam-line of the roll are all edged with narrow black velvet ribbon. During the 17th and 18th centuries the 'pudding' was an important juvenile safety item, worn to protect the head of the young child learning to walk. It usually consisted of a roll of padded fabric resembling a pudding sausage (hence the name), tied horizontally around the head; sometimes as with this one, it had additional flaps tie across the crown of the head, or even strings to fasten beneath the chin. Although a number in everyday use were evidently home-made, using durable dark-coloured fabrics, the children of wealthier families had more elaborately made ones to match their frocks for special occasions. Lady Shelbourne, wife of the 1st Marquess of Lansdown, wrote in her diary describing her son John, Viscount Fitzmaurice on his third birthday in 1768 ..."he really look'd beautiful in a muslin frock of my work over a rosecollour damask coat ... and a rose collor pudding with black and white feathers in it..."
Having been such a characteristic item of early childhood, 'puddings' are represented in a number of paintings of children, by artists who include Rubens, Jan Steen, and Boucher. However, this useful article appears to have died out completely by the early years of the nineteenth century, as corroborated by John Thomas Smith in Nollekens and His Times, published by Henry Colburn in 1829: "...this cap, which is now seldom seen, and I believe totally unknown in the nurseries of the great...."
Actual survivals are extremely rare: during the completion of BGMC's 1993 survey of UK public collections of childhood costume only one example came to light, at the Gallery of English Costume in Manchester.